In January 2019, I had the honor of attending the Association of Language Companies’ UNConference, at the Pasea Hotel and Spa in Huntington Beach, California. While heavy rainfall greeted the conference attendees, the following days were all sunny and warm —meeting everyone’s high expectations for beautiful SoCal weather and complementing an incredible experience! As an attendee of several conferences for translation professionals, I’ve routinely encountered a format in which I’m expected to assume a passive role – listening to speakers give presentations. All. Day. Long. In contrast, this event followed a uniquely hands-on format, which allowed attendees to participate and generate discussion in small groups. Thus, the name “UNConference”. As a first-time participant, I have to say that I initially felt nervous about the discussion format. Would we be asked to stand and address the entire group? Public speaking is a human’s number one fear —even before the fear of dying! Therefore, my uneasiness was justified in some way and I bet I wasn’t alone in my feelings. Fortunately, all my fears proved unwarranted; once the discussion began, I quickly became comfortable speaking in my small group. We were divided into groups of 6 to 8 people with a designated moderator. A topic was assigned to each group for discussion and debate; the topics encompassed a wide range of business areas including human resources, technology, sales and marketing. We were all encouraged to participate and share our personal experiences, opinions, and tips. By asking questions and discussing our stories of both triumphs and challenges, we gained valuable insight from fellow professionals in the industry. The event was attended by approximately 85 professionals from across the globe, although most hailed from various parts of the United States, especially from California (as one might expect given the location). Indeed, issues specific to California took center stage during the kick-off panel discussion, which featured state representatives speaking on the topic of worker classification. The ALC Advocacy Forum was the only part of the event limited entirely to an on-stage panel, as opposed to the discussion group format. A highlight of the UNConference was definitely the environment; the Pasea Hotel and Spa was the perfect venue for the event. Each group had a different, but equally awesome, meeting location around the hotel grounds — usually outdoors facing a beautiful view of the palm trees and the beach. The oceanfront vibe complemented the event’s informal feel and laid-back atmosphere, making it even easier to engage in meaningful conversation. And, of course, the golden sunset became the protagonist when the sessions were coming to a close on Friday evening. 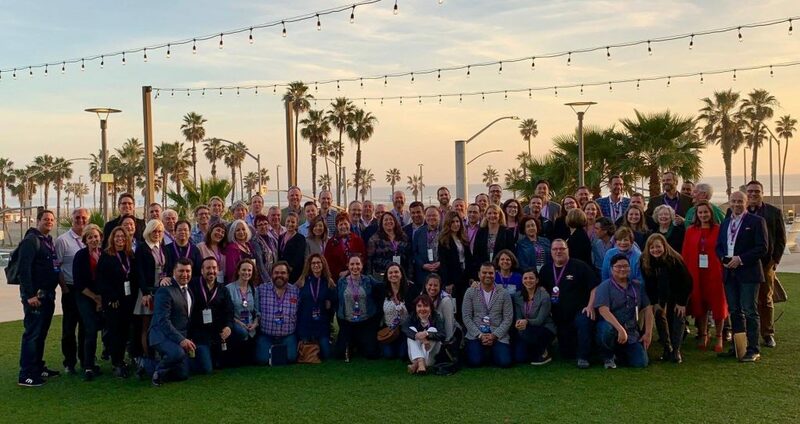 Personally, this was one of my favorite moments of the conference: the sun was setting when ALC´s president, Rick Antezana, suggested that we all gather in an outdoor area of the hotel to take a group picture. Everyone looked cheerful and satisfied, which was a testament to a day of fascinating and productive discussions that would remain forever captured on film. Congratulations to the ALC´s leadership council, and in particular to Rick Antezana and Jennifer Alvarez, for organizing such an amazing event. I look forward to attending the UNConference going forward. I found the conference format to be special and dynamic. It was certainly conducive to forging new relationships and learning from one’s peers—an invaluable asset which we all know lies at the heart of the work in professional translation.